This week I visited my parents in Astoria, OR, which just survived another storm with winds as high as 147 mph. The storm continued for 2 days. My folks survived the storm but lost power for a week. They reported that FEMA and the Coast Guard responded very quickly to provide much needed help to those less fortunate whom lost their homes. Mom was most upset with loosing access to the internet for a week! I took this photo with my cell phone as I was returning home. 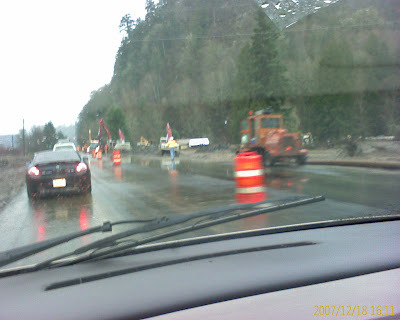 It’s hwy 30 along the Columbia river about 27 miles east of Astoria and is supposed to show the result of a massive mud slide. I saw several homes and a restaurant sitting in mud up to the bottom of their windows. This entry was posted in Astoria on December 20, 2007 by codewienie.